This guide will attempt to organize everything someone living in the Vancouver area might want to know about flying out of U.S. airports. A lot of people fly out of Bellingham to get to Las Vegas, which can be significantly cheaper than flying out of YVR. Allegiant also started flying to Hawaii relatively recently, and there's been some pretty crazy deals, bringing stiff competition to Alaska Airlines, who flys direct to multiple Hawaiian islands. There can also be good fares to California and Arizona. Internationally, deals out of Bellingham are less likely to be much cheaper, or can involve more complicated and lengthier routes than flying out of YVR. It's a smaller airport, and it's strengths are serving the U.S. destinations listed above. Also, when comparing costs, be aware that Allegiant charges extra for absolutely everything, including even carry-on luggage now. 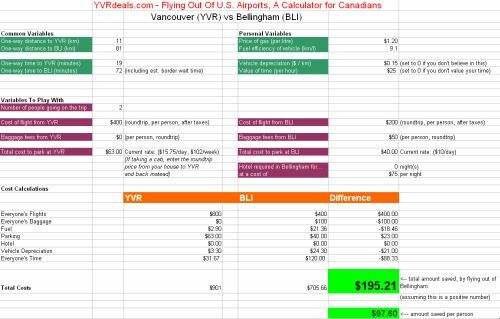 Go to the YVR vs BLI worksheet and enter in a few variables to calculate what your true savings would be. Using common averages, I've found that if the flight from Bellingham is about $100/person less than the flight from Vancouver, the average person is only breaking even. In my opinion, when the flight from Bellingham is at least $200 less per person than the flight from Vancouver, it becomes worth the drive. This is based on my calculations using average factors, and 2 people in a vehicle. You can see the example in the spreadsheet that was used to draw this conclusion. Is there any public transportation from Vancouver to Bellingham airport? Amtrak Train or Bus - $28 roundtrip - but does not go to the airport. Seattle is a major U.S. airport, with practically every airline you can think of. There have been some truly amazing deals out of Seattle in the past, notably to international destinations. Being a relatively large U.S. airport, with so many airlines serving it, the chances of a great deal out of SEA are high. It's usually a question of whether the price differential is great enough to warrant the nearly 3 hour drive each way. The 3 hour drive each way! If you've downloaded the Excel file, please note that you will need to switch to the YVR vs SEA worksheet at the bottom of Excel. 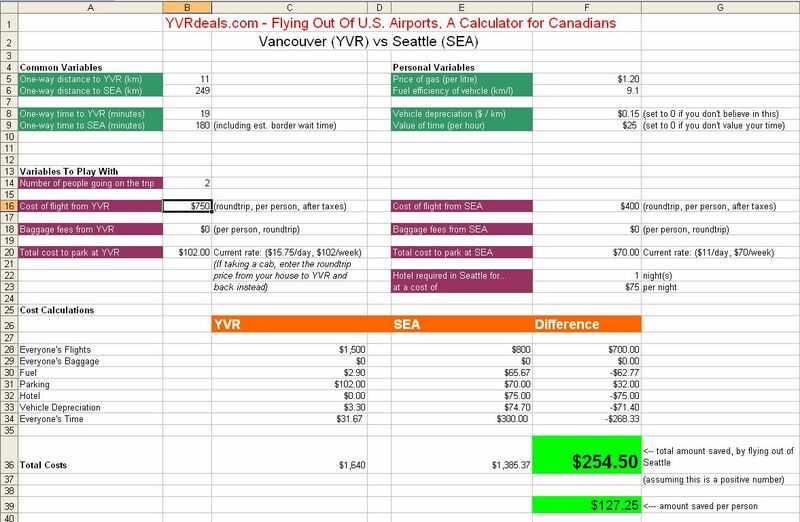 Go to the YVR vs SEA worksheet and enter in a few variables to calculate what your true savings would be. Using common averages, I've found that if the flight from Seattle is about $250/person less than the flight from Vancouver, the average person is only breaking even. In my opinion, when the flight from Seattle is at least $350 less per person than the flight from Vancouver, it becomes worth the drive. This is based on my calculations using average factors, and 2 people in a vehicle. You can see the example in the spreadsheet that was used to draw this conclusion. Parking is currently around $13/day, $75/week at Park N Fly Seattle. If you stay at a hotel near Seattle airport, parking your car is often free while you travel. Is there any public transportation from Vancouver to Seattle airport? Bolt Bus - $36 roundtrip - but does not go to the airport. From the drop-off station, you can take the LightRail system close by, to the airport, for $2.75/person. Look for the southbound platform. Amtrak Train or Bus - $80 roundtrip - but does not go to the airport. Plane: never done it, most expensive, least time sitting but probably travel time similar to driving by the time to you go through security. The most direct option from Victoria to Seattle is the Victoria Clipper - passengers only - $99 roundtrip. There are no really great ways to get to Bellingham quickly and easily. There is ferry service between Sidney and Anacortes (which is closer to Bellingham) but again, a car is probably necessary. The ferry service is year round, but in the summer there are more regular sailings. You can take a shuttle to YVR from the bus station downtown, and then another "quick shuttle" service from YVR to Bellingham airport. But the wait times can really start to add up. vancouver, yvr, bellingham, bli, seattle, sea, guides, united states, victoria and yyj. 15 Responses to "The Official Guide For Canadians Flying Out Of U.S. Airports (from Vancouver & area)"
you forgot about Quickshuttle and the other shuttle buses to Seattle and Bellingham airports. Thanks B, I've added public transportation info to Bellingham and Seattle. Let me know if I'm still missing any! How about Amtrak train/bus from Vancouver to Seattle/Bellingham? I always take this one for convenience. Thanks! Added info about Amtrak. It seems like BoltBus would usually be a much better deal to Seattle? Great article. My fndings are the same as before. They were done several years ago. When I tell people about my findings, they say one of two things: My calcs are wrong or saving $100 per person is still a saving $100. They also like the idea of attaining bragging rights to tell people they've paid $X dollars for the airfare without taking into account all the other factors, typically rationalizing or justifying the other expenses making it still worth it. You forgot to add the cost of assigned seating at BLI. If you don't want to be herded like Cattle and play musical chairs to get a seat, you're forced to pay additional fees for pre-assigned seating. Bolt bus also goes to Bellingham costco. Thank you for sharing your research and analysis Chris! Any chance that we'll see a supplemental analysis that includes transportation options to Bellingham and Seattle airports from Victoria in the near future? Thanks for the suggestions everyone! Mike: I'll look at adding some info on public transport from Victoria. If anyone out there is familiar with getting to BLI or SEA from Victoria by public transport, give me a shout. Spokane airport, for people in the Kootenays and Okanagan. I suggest to add a list of recommended hotels near BLI/SEA which also offer free parking and a shuttle. Luc: Sounds good, anyone have any favorites?